Haven’t heard of it yet? Google “one word” and you’ll find a zillion takes on the concept. Basically, it’s giving up New Year’s resolutions and choosing one word. One word to help you focus during the coming year. God uses small things: mustard seed-size faith, a kernel of wheat, a cup of water. Lisa thought aloud about what her one word might be. I threw out various words that zeroed in on how God’s been steering me. We talked about it over the course of visit. And by New Year’s eve, I had a good sense that my one word for 2013 would be—GO! God had already been challenging me to venture into uncharted waters in ministry—He’d been turning my vision of speaking inside-out and upside-down. I sensed rumblings of change rolling in some time last summer. As I worked with a team of leaders crafting a mission statement for my home church, God prompted me to think about what my own mission statement would be. It came to me instantly—Go ye! 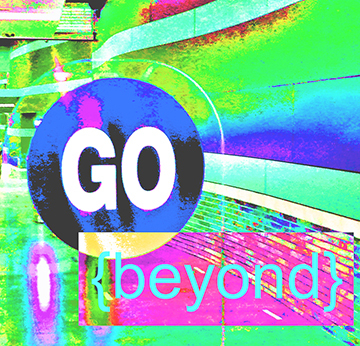 As I thought about my one word, another word kept coming to mind—beyond. Not only has God been planting a burden in me to go, but He’s challenging me to go beyond. Beyond what I’ve known of Him so far. Beyond what’s comfortable, and what has “worked” in the past. to loving others deeply out in the trenches of this broken world. I’ve had a sense of anticipation stirring in me for quite some time now. It’s exciting to step into a new year to see where God leads. This I know for sure, it will be—beyond me. What’s your “one word?” Really, I’d love to hear it—post it as a comment today. Feel free to share why it’s your one word or two words *smile* for 2013. Previous Post Listening: Cumbered much? Hi Amy! Stretch—awesome word. Pretty amazing how one word can worm it’s way into every area of life and blow the doors open, inviting in some fresh air and new opportunities to grow and live bigger. I love your *sparkle* too! Thanks for encouraging me around every bend in the road.